Stupidity doesn’t grow in trees. You usually manage doing it yourself. No, I prefer to blame the weather. You see above we usually make our own entertainment. 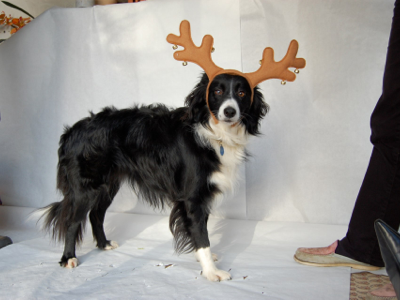 This year we made Kate the Collie the subject of our Christmas cards. She does try to bite the antlers when they fall off; this was the fortieth photo we took, and the only good one.